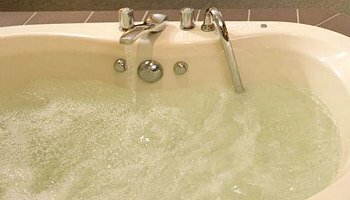 Booking the right hotel room in New York City for your honeymoon or getaway can be a major and expensive task, especially if you’d like a private in-room Whirlpool or JACUZZI® tub. So we’ve taken extra-special care in carefully selecting these romantic hot tub suites for your next NYC couples getaway. Why This NYC Hot Tub Suites Guide is Different: We only list hotels and inns with jetted tubs right in the room - not a soaker tub without jets, not outside on the balcony, and not next to a swimming pool. So you can enjoy maximum privacy in your own hot tub with all the bubbles! 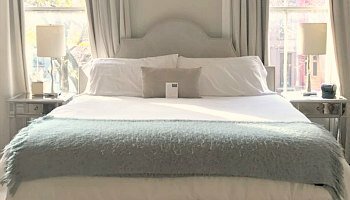 Kimpton Hotel Eventi - beautiful upscale boutique hotel in the heart of Chelsea with spa tubs available in their Premier One Bedroom Suite. What Other Couples Liked: Champagne Anniversary Gift...Floor to Ceiling Windows...Evening Wine Hour. 2018 ERV Rating* for New York City Hotel Suites with a Spa Tub: 94% - Excellent. 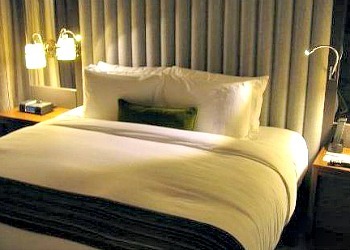 (851 Ave of the Americas, New York NY 212-564-4567) Close to: The High Line, Penn Station, Korea Town. Holiday Inn Express New York City Chelsea - enjoy some hotel room bubbles in Manhattan with one of the Holiday Inn’s King Bed Whirlpool Suites. What Other Couples Liked: Very Good Free Breakfast...Easy Walk to #1 and #2 Subway Lines...Hot Tub After a Day of Walking! 2018 ERV Rating* for Whirlpool Suites in New York City: 80% - Very Good. (232 West 29 St, New York NY 212-695-7200) Close to: Penn Station, PATH Station, Times Square. Inn New York City - historic brownstone townhouse on the Upper West Side, and one of the most well-known of NYC’s romantic inns, with themed suites. Check into the Spa Suite or Opera Suite, each with a luxurious JACUZZI® tub and fireplace. What Other Couples Liked: Easy Walk to the Subway…Sauna in the Spa Suite…Muffins & Fresh Fruit Daily. 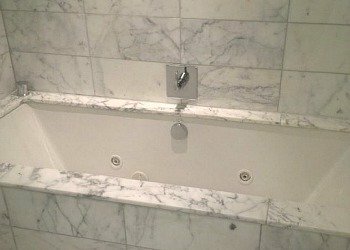 2018 ERV Rating* for Suites With a JACUZZI® Tub in New York City: 98% - Excellent. (266 West 71 St, New York NY 212-580-1900) Close to: Lincoln Center, Museum of Natural History. The Blakely New York - you’re looking for the one-bedroom suite here, and request one with a Whirlpool tub when you book. What Other Couples Liked: Black Tap Burgers and Beer Next Door…Keurig Coffee Makers...Lighted Makeup Mirrors. 2018 ERV Rating* for NYC Hotel Rooms with Jetted Tubs: 90% - Excellent. (136 West 55th St, New York NY 212-245-1800) Close to: Carnegie Hall, Broadway Theatre district. Hilton Garden Inn New York/Tribeca - convenient and affordable, this Hilton Garden Inn offers a great location in vibrant Tribeca, on-site bar & Grille, and Whirlpool tubs in their selected Double Bed and Penthouse suites. What Other Couples Liked: Quiet Rooms...Walk to Greenwich Village...Restaurants, Bars and Cafes Close By. 2018 ERV Rating* for Whirlpool Suites in New York City: 87% - Very Good. (39 Avenue of the Americas, New York NY 212-966-4091) Close to: SOHO Shopping, World Trade Center, Little Italy. Iberostar 70 Park Ave - both the Suite and Iberostar Suite at this 4-Star Midtown hotel feature a comfortable JACUZZI® tub, as well as views of the city and/or Empire State Building. What Other Couples Liked: Comfortable Beds...Friendly Staff...Gift Bottle of Wine for Anniversary. 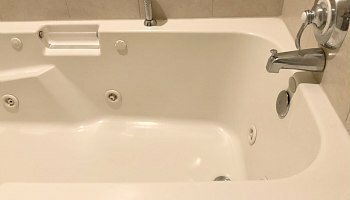 2018 ERV Rating* for Midtown Manhattan Suites with a JACUZZI® tub:80% - Very Good. (70 Park Ave, New York NY 212-973-2400) Close to: Grand Central Station, 5th Ave. Pet Friendly: Dogs Allowed. Avalon Hotel - honeymooners will love the spacious Executive King Suites here with a JACUZZI® tub in the master bath. What Other Couples Liked: Tasty Continental Breakfast…Plenty of Eating Options Nearby…Large, Quiet Rooms. 2018 ERV Rating* for Manhattan Suites With a JACUZZI® Tub: 90% - Excellent. (16 East 32 St, New York NY 212-299-7000) Close to: Times Square, Empire State Building. Pet Friendly: Dogs Allowed. The Kimberly - gorgeous midtown Manhattan hotel that features a rooftop bar open year-round (with glass ceiling and heated floors!) as well as selected one bedroom and Executive Suites with jetted tubs and views of the city. What Other Couples Liked: Mini Kitchens in Unit…Beautiful Boutique Hotel…Subway Across the Street 2018 ERV Rating* for New York City Hotels with Spa Tub Suites: 90% - Excellent. (145 E. 50th St, New York NY 212-755-0400) Close to: Central Park, Rockefeller Center, Radio City Music Hall. Pet Friendly. 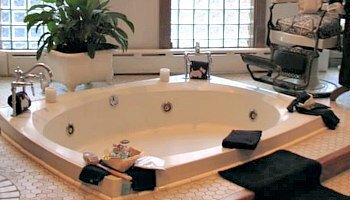 Washington Jefferson Hotel - couples checking into the “WJ” will discover a JACUZZI® Tub in one of their Superior King or Junior Suite rooms. What Other Couples Liked: Boutique Hotel in the Heart of Hell’s Kitchen...On a Quiet Side Street...Steps Away from Restaurants and Entertainment. 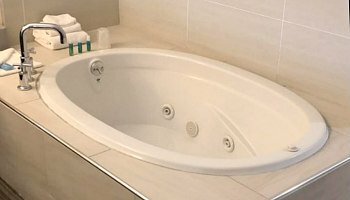 2018 ERV Rating* for NYC Hotel Suites with JACUZZI® Tubs: 72% - Good. (318 West 51 St, New York NY 212-246-7550) Close to: Restaurant Row, Theater District, Times Square. 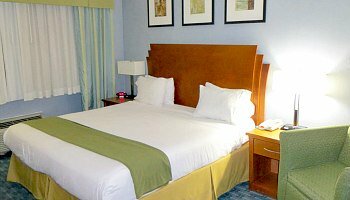 Holiday Inn Express LaGuardia - amenities at this Holiday Inn include a free hot buffet breakfast, exercise room, and in selected suites, a jetted spa tub next to the King bed. What Other Couples Liked: Free Airport Shuttle…Clean and Quiet Rooms…Good Value. 2018 ERV Rating* for Queens NY Budget Whirlpool Suites: 70% - Good. (113-10 Horace Harding Expressway, Flushing NY 718-699-0994) Close to: LGA Airport, 7-Train Subway, US Open Tennis. Distance to Midtown Manhattan: 8 miles. Best Western Jamaica Inn - inexpensive King Bed Whirlpool Suites are available here, and you’ll find a small fridge and microwave inside the unit as well. What Other Couples Liked: 5 Minute Walk to the Subway….Free Breakfast…Free Parking. 2018 ERV Rating* for Queens NY Budget Whirlpool Suites: 60% - Fair. (8707 Van Wyck Expressway, Jamaica NY. 718-291-7500) Close to: Subway. Distance to Midtown Manhattan: 12 miles. Akwaaba Mansion - an amazingly restored 1860’s era Italian Mansion in Stuyvesant Heights. Luxury suites at this B&B include a JACUZZI® Tub for 2, and there’s guest library and games room as well. What Other Couples Liked: Delicious Breakfasts…Quiet Neighbourhood…Cookies & Tea Each Afternoon. 2018 ERV Rating* for Brooklyn B&B’s with an in-room JACUZZI® Tub: 95% - Excellent. (347 Macdonough St, Brooklyn NY 866-466-3855) Close to: A-Trains and C-Trains, Restaurants. Distance to Midtown Manhattan: about 8 miles. Condor Hotel - all rooms have kitchen units at this boutique hotel in Williamsburg, and look for their Luxury Suite on the upper floor which is outfitted with a jetted tub in the master bath. What Other Couples Liked: Fresh Baked Cookies & Tea at the Front Desk…Safe Neighbourhood…Parking Across the Street for $20. 2018 ERV Rating* for Hotel Suites With Hot Tub in Brooklyn, NY: 86% - Very Good. (56 Franklin Ave, Brooklyn NY 718-526-6367) Close to: G-Line Subway, Jewish Community. Distance to Midtown Manhattan: 7 miles. Ramada by Wyndham Bronx - for your budget romantic weekend in the Bronx, this Ramada offers King Hot Tub Suites which include a 50 inch HDTV and Wi-Fi. What Other Couples Liked: Comfortable Beds…Continental Breakfast…Free Parking. 2018 ERV Rating* for Bronx NY Hotel Hot Tub Suites: 70% - Good. (1000 Baychester Ave, Bronx NY). Close to: Bronx Zoo, Yankee Stadium. Distance to Midtown Manhattan: 16 miles.